Head south on Rt. 3. Take exit 6A (Rt. 44 East). Follow Rt. 44 east to the waterfront. Take a right onto Water Street at the waterfront rotary. Follow along the waterfront. Pass the Mayflower and Plymouth Rock. Take the first left at the end of the waterfront on to Union Street (at the Marina). Just past Brewers Marine you will find Plymouth Yacht Club on the left. Head north on Rt. 3. Take Rt. 44 East – Exit 6. Follow the directions above. Plymouth Harbor is 5.5 nm from Duxbury Harbor, 20.6 nm from the eastern entrance of the Cape Cod Canal, and about 28 nm from Provincetown. From anywhere on Cape Cod Bay or Massachusetts Bay, use Plymouth Light Flashing (3) 30s 102ft 14M HORN as your waypoint. Then pick up the buoys and stay north of Browns Bank towards Duxbury Pier (Bug) Light Flashing(2) R 5s 35ft 6M HORN. The channel into Plymouth Harbor is well marked, but be aware that the current reaches close to 1.5 knots at peak ebb. Do not venture too close to Plymouth Beach and give the white/orange day mark near the tip of Plymouth Beach a wide berth as it is marking a submerged jetty. 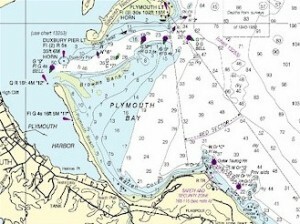 Follow the channel to the breakwater and hail the Plymouth Yacht Club on VHF Ch. 8 or call 508-747-0473 to request a mooring. Mean tidal range is 9.2 feet. Use tide tables for Boston. High tide at Gurnet Point is 4 minutes later; low tide is 9 minutes later. Please use current NOAA charts. Please note that all directions on this page are meant as guidelines and not definitive details. Please rely on proper navigation resources to find your way to the club.